Intel and USC World Building Media Lab bring you an experiment in storytelling that shatters the membrane between audience and content. Leviathan creates an immersive world in which audiences can engage, explore and physically experience virtual environments and fantastic characters. 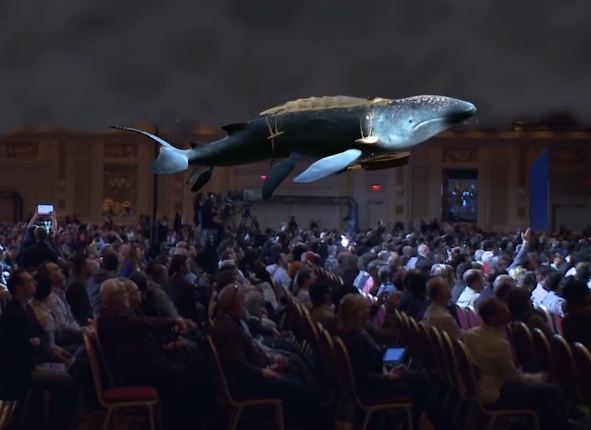 On January 6th, at the Intel Pre-Conference Keynote at CES in Las Vegas, for the first time in public we unveiled the Leviathan Project – a giant Whale that swims above an audience of 5000 reaching out to touch the creature flying overhead. The Leviathan is based on Scott Westerfeld’s novels. For this project I joined a small development team that created three Unity3D augmented reality demonstrations for the Intel keynote and booth. I contributed on interaction design, programming, technology integration, and live operation. Watch the Leviathan segment of Intel’s keynote presentation. Polygon’s coverage of the Intel keynote. Ron Azuma from Intel Labs wrote a great in-depth report on the project, including more pictures and videos. The Leviathan is flying over the CES audience! 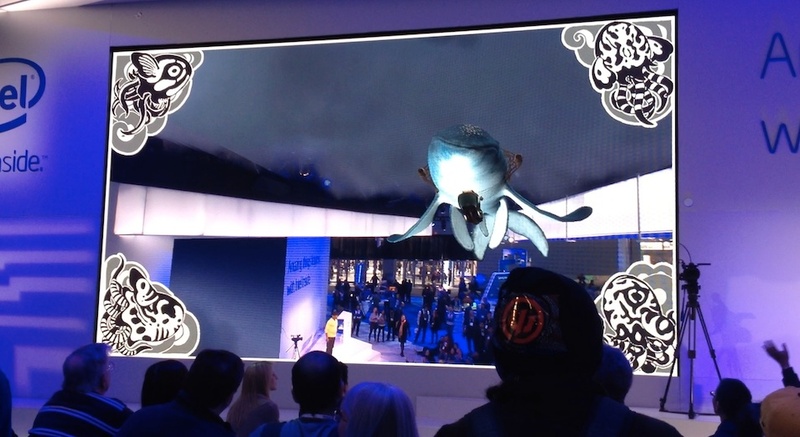 The Intel booth ran an interactive augmented reality presentation of the Leviathan swimming out of the screen over the audience several times each day. At the booth, the Leviathan spawned glowing baby huxleys. Users could play with the huxleys using touch interactions on tablets. This entry was tagged Augmented Reality, CES, Intel, Unity3D, Virtual Reality.